My first visit to The Vineyard at Stockcross in Newbury was a few years ago when I stumbled across a last minute special offer of a weekend night’s stay in one of their delightful Atrium suites for £120, a room that normally costs several hundred pounds. I was well happy, not just because of this bargain rate, but also because this 5-star hotel was truly a delight. It has a luxury Californian vineyard feel to it, boosted by the spa facilities that make this a great weekend escape. We also had an amazing meal, cooked by John Campbell who was the Head Chef at the time and helped The Vineyard to two Michelin-stars. As part of his tasting menu I had this salad which long lives in my memory as one of ‘the’ best salads I have ever tasted. John left in 2010, and chef Daniel Galmiche, who was previously at the famous Cliveden and Michelin-starred L’Ortolan in Berkshire, has since replaced him. Daniel continues to hold a one Michelin-star at The Vineyard and occasionally features on Saturday Morning Kitchen. Other changes since my last visit include the installation of a spectacular glass-panelled cellar in the lobby that showcases some of the 30,000 wines housed at The Vineyard, some of which are Californian award winners. Custodian of the cellar is the charming Head Sommelier Yohann Jousselin who was The Academy of Food and Wine Service’s (AFWS) 2011 UK Sommelier of the Year. This time around I visited The Vineyard on an intimate bloggers evening where we were served a five-course menu with matching wines. 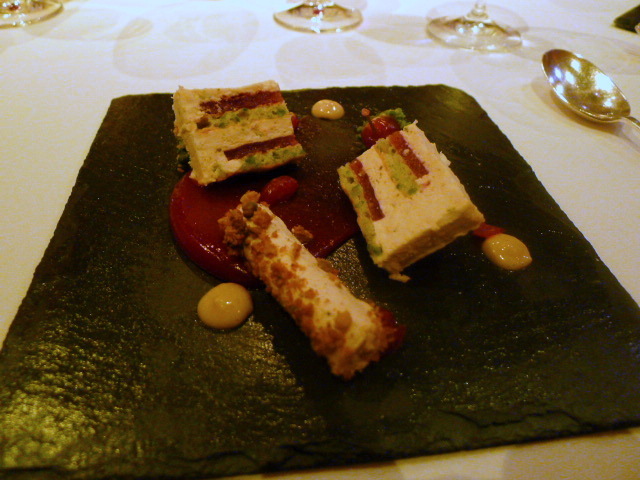 Our starter was a confit of duck foie gras that was beautifully done with a rich, creamy flavour. 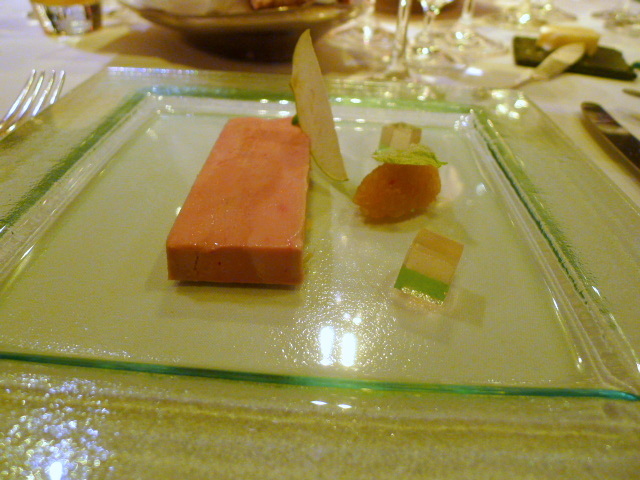 The sweetness of both the quince jelly and braeburn apple chutney worked well with the foie gras, although the brioche bread on the side was a touch dry. A lovely garnish of celery leaf coated with sugar rounded of the presentation nicely. There was a sweetness in the wine pairing of Eroica, Ch Ste Michelle, Washington, 2010, that was for a good match for the foie gras. 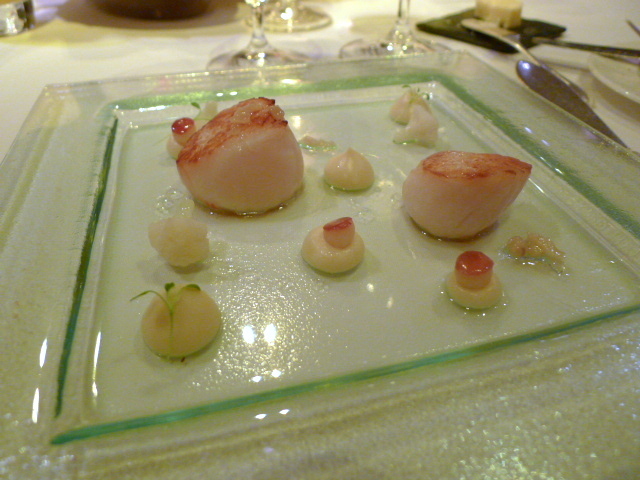 Sweet diver-caught Orkney scallops were cooked as they should be – gently browned with an opaque centre. The addition of walnuts added a lovely crunchiness to the dish, and little cubes of apple provided a hint of sweetness. Touches of cauliflower puree and florets were also lovely. The dish was paired with Quinta do Gaivosa, A. Sousa, Reserva Pessoal, Portugal 2004, a wine which gave the dish a nice acidic boost. 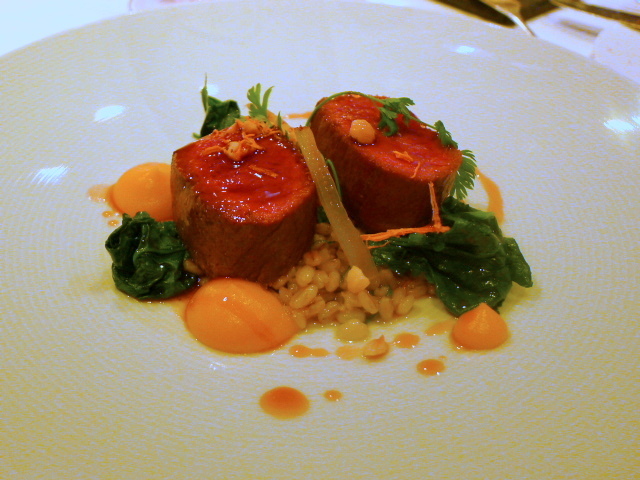 Balmoral Estate venison was perfectly cooked with a beefy, rather than a gamey flavour. Butternut squash and pearl barley matched well with the tender and tasty meat. Particularly delightful were the hazelnuts that gave way to occasional hints of crunchiness in the dish. A full-bodied Freemark Abbey, Merlot, Napa, California, 2010, enriched the flavour of the venison nicely. A Griottine cherry and cranberry terrine with layers of pistachio sponge and a white chocolate mousse proved to be a melting pot of delicious creaminess. A scrumptious pistachio parfait and the nuttiness coming through from the roasted pistachios provided the crunchy texture that helped to lift this dish. The dessert wine was Yves Cuilleron, Roussilliere, Syrah, Rhone, France, NV, a robust wine that worked well with the dessert. 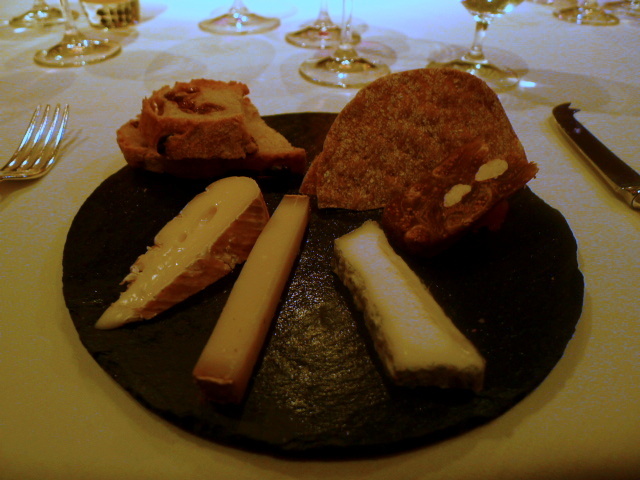 A seasonal farmhouse cheese platter of Tovey, Gruyere and St Nectaire were all perfectly decent, but on the whole were not quite mature enough. Also on the plate was some fig cake that was nicely done and which worked really well with the cheese; quince and some fennel bread that was pleasant but uninspiring. An Eikendal, Chenin Blanc, Late Harvest, South Africa, 2005, was a well-balanced choice for the cheese. 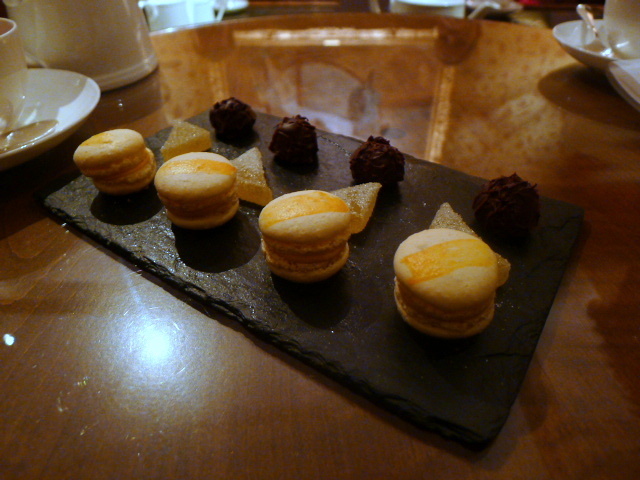 Petit fours included a tasty selection of macaroons, chocolates and jellies. This was a lovely, lovely meal embracing an elegant and refined purist French style. The approach bore no gimmicks or molecular touches, nor did it produce any jaw-dropping moments. Simply put, this was a highly enjoyable and delicious dinner, served in a gracious and classy setting with little to fault. On Food: Five dishes from the a la carte menu costs £75, or you can choose dishes as you wish from the a la carte. A 7-course tasting menu without wines is £95. The same menu paired with two wines per course (a French and Californian) is £185. On Accommdation – standard ‘luxury’ doubles start from £200 and go up to about £500 for a Grand Suite. There are dinner, bed and breakfast offers as well, so check out The Vineyard website.